When you need to relax and refuge from the hectic days in big cities, perhaps beach cottage is a place where you want to be. 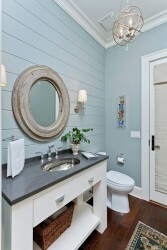 In the process of designing your beach cottage home, you must include a comfortable bathroom design. 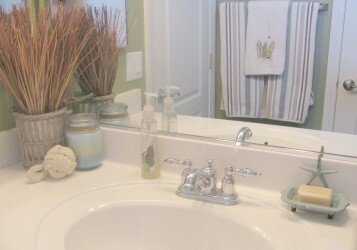 Beach cottage is typically incorporating soft lighting, wind chimes and soothing colours. 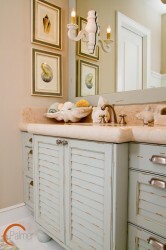 Those are only some of great choices for a beach bathroom design. Regarding wind chimes. 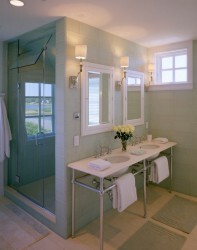 The purpose of installing wind chimes is to create reflection of light in your small beach cottage bathroom. Fill the ceiling of your bathroom with tiny mirror wind chimes or mobiles to create reflections of natural light around the space. Each wind chime should be no longer than 6 inches. For best results, add as many wind chimes as possible. 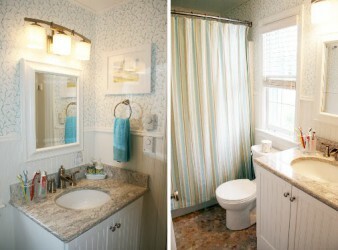 When the bathroom window is open, sea breezes will enter making the reflected light appear to sparkle against the walls. 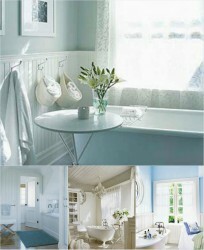 Choose a cool blue paint colour for the walls and glass mosaic tile for the floor to open up the space. Wind chimes can be found in the home and garden section of department stores, bookstores and speciality shops. Go with Vintage Style. 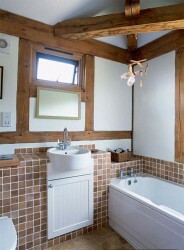 Porcelain claw foot bathtub is vintage style element that can define your private area in relaxation. 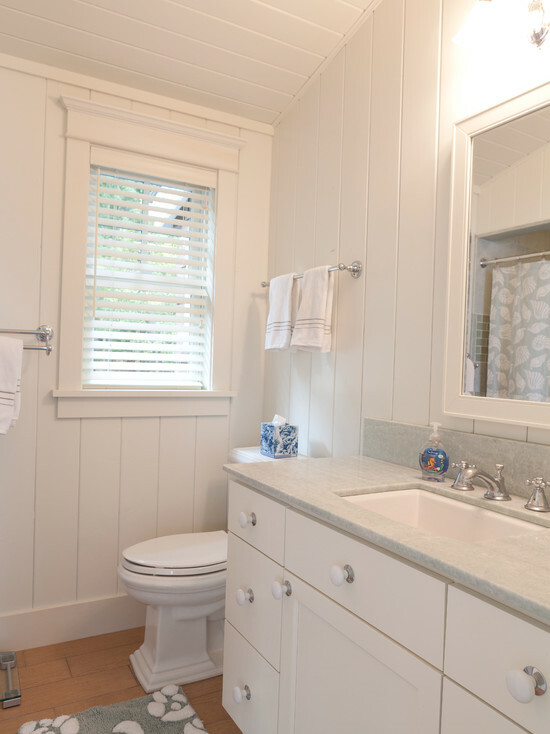 Additionally To create relaxing atmosphere in the small bathroom in seascape, you can paint the walls in a light sea green and add matching hand towels to your decor. 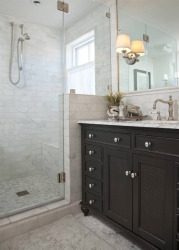 You and your houseguests will enjoy listening to the ocean waves in the distance while soaking in the bathtub. If you enjoy having the bathroom windows open, hang a mosquito net around the bathtub to keep away-unwanted insects. The mosquito net also provides privacy if your bathroom window opens to a patio. 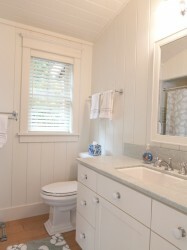 Install white ceramic tile flooring and a tile baseboard as an accent to the tub. 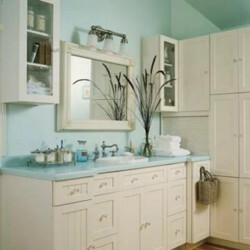 Complete the mood with vintage wall sconces that add a soft glow to your bathroom. 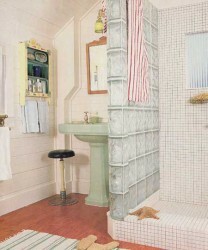 Vintage style in cottage bathroom is ideal to remind you nostalgic memories of your holidays or favourite moments outdoor. Soothing colours, natural furnishings and a light-filled environment can transform an ordinary bathroom into a serene, coastal retreat. Ramp up the peaceful seashore appeal with a few of your favourite ocean-inspired accessories. To do so, scatter a few of your sea-inspired treasures around the space, such as a woven basket containing sand dollars and starfish, colourful glass bottles filled with sand and clear jars packed full of seashells.